Background: Gastric cancer is one of the most frequent malignancies in the world, ranking fifth in the Netherlands as a cause of cancer death. Surgery is the only curative treatment for advanced cases, but results of gastrectomy largely depend on the stage of the disease. A better understanding of the mechanisms of progression from a preneoplastic condition through intraepithelial neoplasia to invasive cancer may provide information relevant to designing focused prevention strategies. Methods: Because the pattern of chromosomal aberrations in precursors of gastric cancer is unclear, 11 gastric polyps with intraepithelial neoplasia (three hyperplastic polyps and eight adenomas) were analysed by microarray comparative genomic hybridisation to study chromosomal instability in precursors of gastric cancer. Results: Chromosomal aberrations were detected in all specimens. Adenomas showed no more chromosomal aberrations than did the hyperplastic polyps. 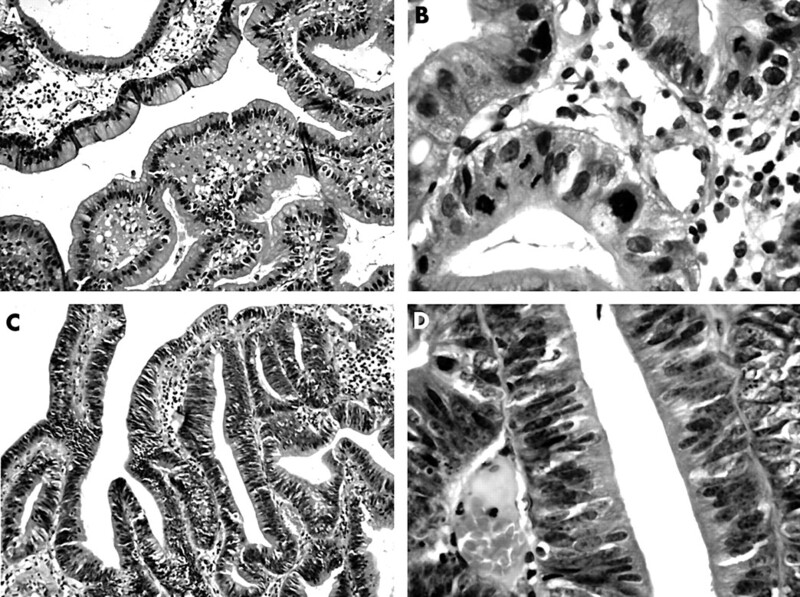 The most frequent aberrations were gain of 7q36 and 20q12, and loss of 5q14–q21 in the adenomas, and loss of 15q11–14, 1p21–31, and 21q11–21.2 in the hyperplastic polyps. The most frequent chromosomal aberration in common to both types was loss of 9p21.3. Conclusion: Hyperplastic polyps showed many chromosomal aberrations, confirming that neoplastic transformation can occur in these lesions. These observations are consistent with the existence of two morphologically and genetically distinct pathways to gastric cancer—the hyperplastic polyp pathway and the (intestinal type) adenoma pathway. The relative contribution of each to gastric carcinogenesis in general, and how they compare to patterns of chromosomal aberrations in the more prevalent flat foci of intraepithelial neoplasia remain to be determined. Gastric cancer is one of the most frequent malignancies in the world, and even the most frequent in some areas, such as Japan. The prognosis of this malignancy remains very poor. In the Netherlands, gastric adenocarcinoma ranks fifth as a cause of cancer death, with approximately 2200 new cases annually.1 Surgery is the only possible curative treatment for advanced cases, but results of gastrectomy largely depend on the stage of the disease. Detection and removal of gastric mucosal neoplasias in an early or even premalignant stage can contribute to improved disease outcome. This notion has led to population based screening strategies in high incidence countries.2,3 However, in low and average risk countries the success of population based screening seems less obvious. A better understanding of the mechanisms leading to the progression from intraepithelial neoplasia (formerly termed dysplasia) to cancer may provide new insights that are relevant for designing focused prevention strategies. According to the Correa model, the pathogenesis of the most frequent form of gastric adenocarcinoma (the intestinal type) morphologically follows a sequence of Helicobacter pylori infection causing active and subsequent chronic active gastritis, leading to mucosal atrophy and intestinal metaplasia in a small number of cases, followed by intraepithelial neoplasia, and ultimately invasive adenocarcinoma.4–6 One of the key features in the pathogenesis of many solid cancers, including gastric carcinoma, is chromosomal instability, a condition that can be analysed by comparative genomic hybridisation (CGH). CGH yields in a single experiment, an overview of the DNA copy number changes (gains and losses) present in a tumour, it can be applied to formaldehyde fixed, paraffin wax embedded material, and is well suited for the analysis of premalignant lesions.7 In the stomach, intraepithelial neoplasia mainly presents as small lesions, often admixed with non-tumour cells, which are less suitable for CGH. In a few cases, intraepithelial neoplasia presents as larger polypoid lesions; that is, adenomas. Hyperplastic polyps almost never occur in normal gastric mucosa, but almost always against a background of chronic active gastritis.8,9 They are thought to result from regeneration after mucosal damage—for example, as a result of H pylori induced gastritis. Hyperplastic polyps in principle are reactive in nature, but on rare occasions they may contain intraepithelial neoplasia or even adenocarcinoma.8,10–13 Little is known about the molecular background through which hyperplastic polyps develop. Microsatellite instability14 and mutation of the K-ras oncogene15 have been reported to occur in a subset of hyperplastic polyps. Both adenomas and hyperplastic polyps can yield enough DNA for CGH. 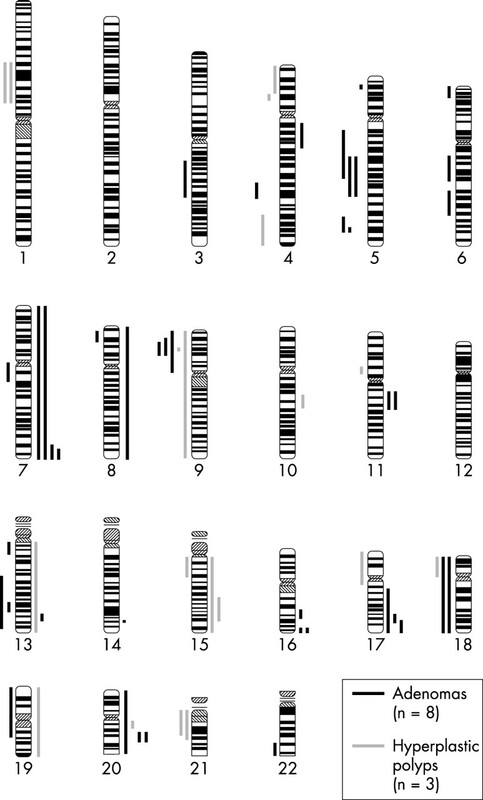 A few studies have already analysed chromosomal imbalances in premalignant gastric lesions by chromosome based CGH, and some chromosomal regions with frequent gains or losses have been identified.16–18 However, this information was obtained by chromosome based CGH, a technique with a limited resolution of 3–10 Mb. Microarray based CGH has a much higher resolution, as we have demonstrated previously in the analysis of the 20q13.2 amplicon that is frequently found in gastric cancer.19 Such higher resolution may allow the detection of smaller chromosomal changes. Therefore, in our present study, gastric adenomas and some rare cases of hyperplastic polyps with intraepithelial neoplasia were analysed by microarray CGH to study the presence of chromosomal instability in precursors of gastric cancer. Our study comprised 11 gastric polyps with intraepithelial neoplasia (three hyperplastic polyps, and eight adenomatous polyps). Of the patients, six were male, and five were female. Two hyperplastic polyps contained low grade intraepithelial neoplasia and one showed high grade intraepithelial neoplasia (fig 1). It should be noted that hyperplastic polyps with intraepithelial neoplasia are exceptions. Three adenomas contained low grade, and five high grade intraepithelial neoplasia. Four adenomas showed a tubular architecture and four were tubulovillous. (A) Gastric hyperplastic polyp at ×10 magnification showing villous and tubular structured lines with cylindrical epithelium and disturbed differentiation. The stroma is oedematous, with a chronic inflammatory infiltrate. (B) At ×40 magnification, the epithelium of the same hyperplastic polyp shows severe atypia, with enlarged nuclei that are hyperchromatic and polymorphic. (C) At ×10 magnification of a tubulovillous adenoma, multiple mitoses can be seen, many of which are atypical; there are irregular crypts and leaf-like projections. (D) At ×40 magnification, the epithelium of the same adenoma shows mucin depletion, crowding, and stratification of atypical nuclei. Microarrays were produced as described previously.21 In short, DNA isolated from BAC clones was amplified using ligation mediated polymerase chain reaction to generate representations of these human BAC DNAs. The DNA samples were spotted on chromium coated microscope slides using a custom built arrayer. A genome wide scanning array was used as described previously.21–23 The array comprised DNA samples from 2275 BAC and P1 clones spotted in triplicate, evenly spread across the whole genome at an average resolution of 1.4 Mb. Chromosome X clones (n = 61) were discarded from further analysis because all tumour samples were hybridised to male reference DNA, leaving 2214 clones for each array to be evaluated. Test and reference genomic DNA (300–500 ng of each) were labelled by random priming (BioPrime DNA labelling system; Gibco BRL, Gaithersburg, Maryland, USA) in a 50 μl reaction with Cy3 dCTP (Amersham Pharmacia Biotech, Piscataway, New Jersey, USA) and Cy5 dCTP (Amersham Pharmacia Biotech), respectively, as described previously.21 Non-incorporated nucleotides were removed using a Sephadex G-50 spin column. Labelled DNA (∼600–1000 ng of input DNA) was mixed with Cot-1 DNA (80–100 μg; Gibco BRL) and ethanol precipitated. The precipitated DNA was dissolved in hybridisation mix (50 μl) to achieve a final composition of 50% formamide, 10% dextran sulfate, 2× saline sodium citrate (SSC), 4% sodium dodecyl sulfate, and 500 μg yeast tRNA. The hybridisation solution was heated to 70°C for 10–15 minutes to denature the DNA, and then incubated at 37°C for approximately 60 minutes to allow blocking of the repetitive sequences. A ring of rubber cement was applied closely around the array to form a well into which we added 50 ml of slide blocking solution containing 250 mg salmon sperm DNA. After a 30 minute incubation period at room temperature, approximately three quarters of the blocking solution was removed, and the denatured and reannealed hybridisation mixture was added. The arrays were placed on a slowly rocking table (∼1 revolutions/minute) at 37°C to allow hybridisation to occur over 48–72 hours. After hybridisation, slides were washed once in 50% formamide, 2× SSC, pH 7.0, at 45°C for 15 minutes, and once in PN buffer (0.1M sodium phosphate, 0.1% nonidet P40, pH 8.0) at room temperature for 15 minutes. Excess liquid was drained from the slides and the array was mounted in 90% glycerol, 10% phosphate buffered saline, 1mM diaminophenylindole (DAPI) solution to counterstain the DNA targets. UCSF SPOT software24 (http://jainlab.ucsf.edu/Projects.html) was used to automatically segment the spots based on the DAPI images, perform local background correction, and to calculate various measurement parameters, including log2 ratios of the total integrated Cy3 and Cy5 intensities for each spot. A second custom program, SPROC (http://jainlab.ucsf.edu/Projects.html), was used to associate clone identities and a mapping information file with each spot, so that the data could be plotted relative to the position of the BACs on the September 2000 or August 2001 freeze of the draft human genome sequence (http://genome.ucsc.edu/). The SPROC output consists of log2 transformed averaged fluorescence ratios of the triplicate spots for each clone, standard deviations of the triplicates, and plotting position for each clone on the array. Ratios of clones for which only one of the triplicates remained after SPROC analysis were excluded from further analysis. Chromosomal aberrations were classified as a gain when the normalised log2 transformed fluorescence ratio was higher than 0.2, and as a loss when this ratio was below −0.2. Neighbouring clones with a similar log2 transformed fluorescence ratio exceeding these borders were regarded as belonging to the same chromosomal gain or loss, respectively. Multiple gains and losses were counted as separate events. Chromosomal aberrations were detected in all three gastric hyperplastic polyps and eight adenomas studied. Figure 2 and table 1 provide an overview of the copy number changes. 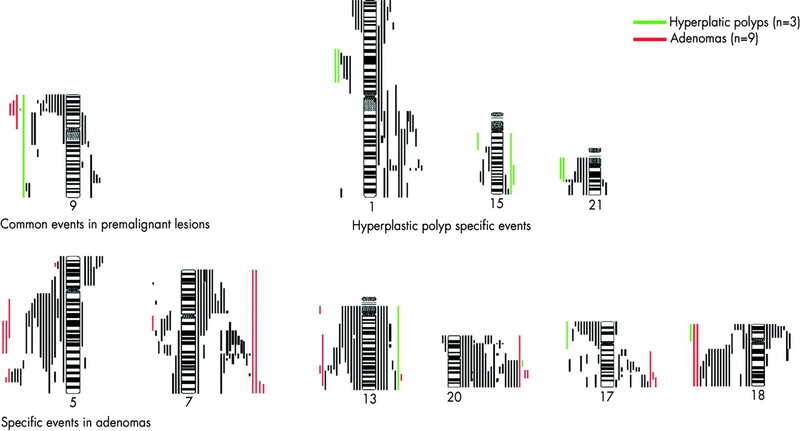 Overview of chromosomal aberrations in gastric adenomas (n=8; black bars) and hyperplastic polyps (n=3; grey bars), as detected by array comparative hybridisation. Bars on the left of the ideograms (850 bands resolution) indicate losses, and on the right gains. None of the cases showed amplifications (high level gains). The mean numbers of events, gains, and losses were comparable between the hyperplastic polyps (6.7, 2.0, 4.7, respectively) and the adenomas (5.4, 2.5, 2.9, respectively). The five lesions with low grade intraepithelial neoplasia showed a mean of 3.8 events (SD, 1.3), and the six with high grade intraepithelial neoplasia a mean of 7.3 CGH events (SD, 3.7). Within the adenomas, the three with low grade intraepithelial neoplasia showed a mean of 3.3 events (SD, 1.5), and the five with high grade intraepithelial neoplasia a mean of 6.6 chromosomal aberrations (SD, 3.7) for each case. Of the three hyperplastic polyps, the two with low grade intraepithelial neoplasia showed a mean of 4.5 (range, 4–5) chromosomal events and the one hyperplastic polyp with high grade intraepithelial neoplasia showed 11.0 events. In the adenomas, the most frequent aberrations were gain of 7q36 and 20q12 (in four and three of the eight cases, respectively), and losses of 5q14–21 (in three of the eight cases), whereas in the hyperplastic polyps, loss of 15q11–14, 1p21–31, and 21q11–21.2 (each in two of the three cases) were most prevalent. The most frequent chromosomal aberration that both types of polyps had in common was loss of 9p (five of 11 cases), with a common region of overlap at 9p21.3. Gastric cancer is a very common disease with a poor outcome in most cases. The disease is strongly associated with colonisation with H pylori. Although several precursor lesions for gastric adenocarcinomas have been recognised, we know very little about the pattern of chromosomal aberrations in these precursors of gastric cancer, or the role of these lesions in the process of progression to cancer.16–18 This is largely because most of the time biopsies from flat intraepithelial neoplasias, the most common precursor of gastric cancer, are too small for CGH analysis or contain too many contaminating non-tumour cells. Therefore, gastric adenomas provide a better opportunity for surveying the pattern of chromosomal changes occurring during the pathogenesis of gastric cancer, although probably only a minority of all gastric cancers actually arise from adenomas. A certain analogy exists with the adenoma–carcinoma sequence in the large intestine, although adenomas are much less prevalent in the stomach than in the colon. For hyperplastic polyps, the situation is even less clear. In general, hyperplastic polyps are thought to be reactive in nature, rather than neoplastic. Nevertheless, a few studies report the occurrence of cancer in gastric hyperplastic polyps.11,13 In our present study, we were able to analyse chromosomal changes in three hyperplastic polyps with intraepithelial neoplasia. It should be stressed that intraepithelial neoplasia in hyperplastic polyps of the stomach is an exceptional finding, and therefore these data cannot simply be extrapolated to gastric hyperplastic polyps in general. Nevertheless, the analysis of these lesions is meaningful because it allows the comparison of DNA copy number changes in different types of precursors of gastric cancer. To our knowledge, our study is the first to analyse precursors of gastric cancer with the sensitive and high resolution microarray CGH technique. Given the lack of knowledge on chromosomal changes in precursors of gastric cancer, and the fact that these lesions are difficult to study, even the analysis of a relatively small number of samples with an advanced technique like microarray CGH can yield relevant information. We found chromosomal instability in all the gastric adenomas and hyperplastic polyps with intraepithelial neoplasia analysed. The most frequent aberration in these 11 gastric polyps was loss of 9p21.3, which is in concordance with other observations.18 Two well known tumour suppressor genes (p15 and p16 (ink4/arf)) are located at this chromosomal region. Adenomas did not show more chromosomal aberrations than did the hyperplastic polyps with intraepithelial neoplasia. Apart from the loss of 9p21.3, hyperplastic polyps showed a different genetic profile to adenomas, with gain of 7q36 and 20q12 and loss of 5q14–21 as the most common events in the adenomas, compared with gain of 15q11–14 and loss of 1p21–31 and 21q11–21.2 in the hyperplastic polyps. Not surprisingly, when comparing these data with those previously obtained by microarray CGH in a series of gastric cancers (unpublished data, 2002), it is clear that the mean number of events, gains, and losses was lower in the hyperplastic polyps (6.7, 2.0, and 4.7, respectively) and the adenomas (5.4, 2.5, and 2.9, respectively) than in the 35 gastric carcinomas (16.0, 7.9, and 7.1, respectively). In addition, no amplifications were detected in the hyperplastic polyps and the adenomas, whereas in the carcinomas a mean of 1.0 amplification/case was detected. Interestingly, several of the chromosomal changes in the gastric carcinomas also occurred in some of the adenomas and hyperplastic polyps, including the loss of 9p21.3 that occurred in both adenomas and hyperplastic polyps. Some of the other cancer related chromosomal aberrations in our present series appeared to be more specifically related to the type of polyp. For example, gain of 15q11–14 (one of 35 carcinomas), loss of 1p21–31 (four of 35 carcinomas), and loss of 21q11–21.2 (five of 35 carcinomas) were seen only in the hyperplastic polyps, whereas loss of 5q14–21 (12 of 35 carcinomas), loss of 5q34 (seven of 35 carcinomas), gain of 7q36 (two of 35 carcinomas), loss of 13q31 (10 of 35 carcinomas), gain of 17q25 (five of 35 carcinomas), loss of chromosome 18 (18p in seven, and 18q in 16 of 35 carcinomas), and gain of 20q12 (19 of 35 carcinomas) were seen only in adenomas (fig 3). Frequent chromosomal copy number changes in premalignant lesions (both adenomas and hyperplastic polyps) in comparison with gastric adenocarcinomas. The most frequent aberration in the precursor lesions is loss of 9p21.3. Furthermore, gain of 15q11–14 (one of 35 carcinomas), loss of 1p21–31 (four of 35 carcinomas), and loss of 21q11–21.2 (five of 35 carcinomas) were only seen in the hyperplastic polyps, whereas loss of 5q14–21 (12 of 35 carcinomas), loss of 5q34 (seven of 35 carcinomas), gain of 7q36 (two of 35 carcinomas), loss of 13q31 (10 of 35 carcinomas), gain of 17q25 (five of 35 carcinomas), loss of chromosome 18 (18p in seven and 18q in 16 of 35 carcinomas), and gain of 20q12 (19 of 35 carcinomas) were only seen in adenomas. Several studies have pointed to the risk of gastric cancer arising in hyperplastic polyps, and a genetic predisposition for cancer prone hyperplastic polyps in the stomach has even been described.25 However, it is important to realise that intraepithelial neoplasia, and probably also chromosomal instability, is a very rare event in gastric hyperplastic polyps. Consequently the hyperplastic polyps studied here are not representative of gastric hyperplastic polyps in general. Nevertheless, the findings could be informative for the pathogenesis of gastric cancer. Interestingly, H pylori infection plays a role in the pathogenesis of both hyperplastic polyps and gastric cancer.26 The microarray CGH results of one of the hyperplastic polyps analysed in our study underlines the hypothesis that neoplastic transformation can occur in these lesions. Despite the fact that histologically this lesion was a true hyperplastic polyp, with high cylindrical, foveolar type of epithelium and an oedematous stroma with chronic inflammatory infiltrate, it showed portions with severe nuclear atypia, and in these areas there were many chromosomal aberrations, and the pattern of changes was similar to that seen in cancer. These observations are consistent with the existence of two morphologically and genetically different pathways to gastric cancer; that is, the “hyperplastic polyp with intraepithelial neoplasia type” pathway and the “adenoma type” (intestinal type) pathway (fig 3). To a certain extent, this parallels the situation in the large intestine where alternative routes through hyperplastic polyps have also been proposed, although histological hyperplastic polyps of the stomach and large intestine are different lesions.27 What the relative contribution of each of these pathways is to gastric carcinogenesis in general, and how they compare to patterns of chromosomal aberrations in the more prevalent flat foci of intraepithelial neoplasia, remain to be determined. However, the fact that the chromosomal changes seen in both types of polyps also belong to the more prevalent ones seen in gastric cancer, in addition to the fact that several of the chromosomal aberrations reported here have been reported before in gastric premalignant lesions, indicate that these changes are relevant.16–18 Further studies on larger series should reveal the relative contribution of each of these pathways, and might provide detailed knowledge of the molecular pathways involved, which may open up possibilities for new diagnostic approaches for early detection of gastric cancer, or even reveal molecular targets that may provide opportunities for pharmacological intervention in tumour progression. The authors would like to thank N Brown for printing the microarray slides. This work was supported by the University Stimulation Foundation of the VU University (USF) and a Gastrostart grant from the Dutch Society of Gastroenterology. Visser O, Coebergh J, Schouten L, et al. Incidence of cancer in the Netherlands 1997. Utrecht: 2001. Shiratori Y, Nakagawa S, Kikuchi A, et al. Significance of a gastric mass screening survey. Am J Gastroenterol1985;80:831–4. Hisamichi S, Sugawara N, Fukao A. Effectiveness of gastric mass screening in Japan. Cancer Detect Prev1988;11:323–9. Correa P, Haenszel W, Cuello C, et al. A model for gastric cancer epidemiology. Lancet1975;2:58–60. Meining A, Riedl B, Stolte M. Features of gastritis predisposing to gastric adenoma and early gastric cancer. J Clin Pathol2002;55:770–3. Coma del Corral MJ, Pardo-Mindan FJ, Razquin S, et al. Risk of cancer in patients with gastric dysplasia. Follow-up study of 67 patients. Cancer1990;65:2078–85. Hermsen M, Postma C, Baak J, et al. Colorectal adenoma to carcinoma progression follows three distinct pathways of chromosomal instability. Gastroenterology2002;123:1109–19. Abraham SC, Singh VK, Yardley JH, et al. Hyperplastic polyps of the stomach: associations with histologic patterns of gastritis and gastric atrophy. Am J Surg Pathol2001;25:500–7. Stolte M. Hyperplastic polyps of the stomach: associations with histologic patterns of gastritis and gastric atrophy. Am J Surg Pathol2001;25:1342–4. Orlowska J, Jarosz D, Pachlewski J, et al. Malignant transformation of benign epithelial gastric polyps. Am J Gastroenterol1995;90:2152–9. Daibo M, Itabashi M, Hirota T. Malignant transformation of gastric hyperplastic polyps. Am J Gastroenterol1987;82:1016–25. Papa A, Cammarota G, Tursi A, et al. Histologic types and surveillance of gastric polyps: a seven year clinico-pathological study. Hepatogastroenterology1998;45:579–82. Debongnie JC. Gastric polyps. Acta Gastroenterol Belg1999;62:187–9. Nogueira AMMF, Carneiro F, Seruca R. Microsatellite instability in hyperplastic and adenomatous polyps of the stomach. Cancer1999;86:1649–56. Dijkhuizen SM, Entius MM, Clement MJ, et al. Multiple hyperplastic polyps in the stomach: evidence for clonality and neoplastic potential. Gastroenterology1997;112:561–6. Kim YH, Kim NG, Lim JG, et al. Chromosomal alterations in paired gastric adenomas and carcinomas. Am J Pathol2001;158:655–62. Kokkola A, Monni O, Puolakkainen P, et al. Presence of high-level DNA copy number gains in gastric carcinoma and severely dysplastic adenomas but not in moderately dysplastic adenomas. Cancer Genet Cytogenet1998;107:32–6. van Dekken H, Alers JC, Riegman PHJ, et al. Molecular cytogenetic evaluation of gastric cardia adenocarcinoma and precursor lesions. Am J Pathology2001;158:1961–7. Weiss MM, Snijders AM, Kuipers EJ, et al. Determination of amplicon boundaries at 20q13.2 in tissue samples of human gastric adenocarcinomas by high-resolution microarray comparative genomic hybridisation. J Pathol2003;200:320–6. Weiss MM, Hermsen MA, Meijer GA, et al. Comparative genomic hybridisation. Mol Pathol1999;52:243–51. Snijders AM, Nowak N, Segraves R, et al. Assembly of microarrays for genome-wide measurement of DNA copy number. Nat Genet2001;29:263–4. Albertson DG, Ylstra B, Segraves R, et al. Quantitative mapping of amplicon structure by array CGH identifies CYP24 as a candidate oncogene. Nat Genet2000;25:144–6. Pinkel D, Segraves R, Sudar D, et al. High resolution analysis of DNA copy number variation using comparative genomic hybridization to microarrays. Nat Genet1998;20:207–11. Jain AN, Tokuyasu TA, Snijders AM, et al. Fully automatic quantification of microarray image data. Genome Res2002;12:325–32. Carneiro F, David L, Seruca R, et al. Hyperplastic polyposis and diffuse carcinoma of the stomach. A study of a family. Cancer1993;72:323–9. Jass JR, Whitehall VL, Young J et al. Emerging concepts in colorectal neoplasia. Gastroenterology2002;123:862–76.